Tim Mullooly: Welcome back to living with money, this is Tim Mullooly. 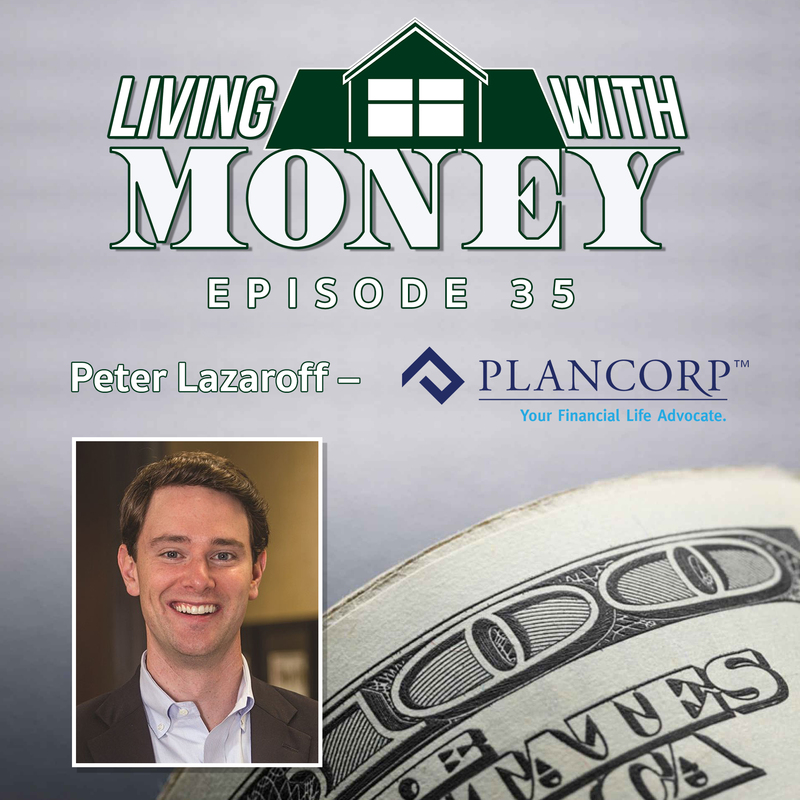 On today’s episode I’m joined by Peter Lazaroff, Peter is a CFA and a CFP. I’ve been following Peter on Twitter, following his writing and blog posts for a while now. So I’m very happy to have him on the podcast. Peter thanks for coming on. Peter Lazaroff: Tim, thanks for having me. Tim Mullooly: For the listeners out there, can you provide just a brief background about yourself. How you got started in the business and how you got to where you are today? Peter Lazaroff: Sure. I’m one of those weird people who had a general idea of what they wanted to do with their life at a pretty young age. I remember getting a share of Nike stock from my grandma and just being totally hooked by the idea of getting these dividend checks. The stock kept splitting so all of a sudden I had more shares. I think I was 12 or 13 at the time. So granted a lot of this didn’t make sense to me, but I was like, “Oh, I’m going to work in stocks.” That’s a pretty nebulous term to think that, but I think what happened is I took a general interest in finance. I worked throughout high school, winter, summer. In the summer I usually had two jobs and I was just super interested in saving and investing, so I made it a big priority. When I went to college I studied economics, which ultimately didn’t really do much to help my career. But when I came out I started as a stock analyst and a trader. I worked at a RIA that CEFEX certified as a fiduciary, so I more by accident, I got brainwashed in a way that I now believe is the right way to do things. I think over time, as I tried to learn more, I started writing to take notes. I think that’s really where a big pivot point in my career began. I started transitioning, I’d taken the CFA exam and when I think I finished the CFA in 2012, maybe 2011 … I think it was 2012. I was starting to do more client facing stuff where I’d go out and network with people. We had a million dollar minimum and it was so hard find people at a young age as 24, 25. I started leaning on writing as a way to keep in touch with people. When I was an analyst I took really detailed notes just to help myself absorb and retain information. Those notes eventually got distributed to the firm through an internal email. Ultimately for me, it just started helping me organize my thoughts. I think that helped me communicate to clients better and sort of changed the role I had at my initial firm. In general, I think writing helps you learn better. Both of my parents were doctors and they always talked about this learning process through see one, do one, teach one that med students to through. Writing has always been my teach one. When I came to Plancorp, came in as the director of investment research. I’m now the co-chief investment officer. Really what that entails is just helping develop investment strategy and communicating that strategy. I feel real fortune to thought, “Hey, I want to work with stocks,” when I was 12. To kind of have that over time and have it be a genuine interest. I read about finance like I read about my local sport teams. I’m just truly passionate about it. I do it in my free time. I do other stuff too, but I’ve been really fortunate to have this kind of dream and have it actually work out. Tim Mullooly: Yeah, like you said right off the bat, that it’s kind of rare to know exactly or generally what you want to do. Then actually stick with it and have it be your career. I related to what you were saying about 24 or 25 years old and going out and trying to find these million dollar clients. That’s through writing, that’s a way to flush out your thoughts and kind of solidify your knowledge of the topic and gain more confidence when talking to perspective clients, right? Peter Lazaroff: Absolutely. I think clarity of thought always follows clarity of writing. So it’s definitely helped me. Both in my decision making and accountability, it’s helped me in my communication, and I think it’s helped with credibility at a younger age. Now that … I mean I’m still pretty young, I’m 33, but I still think it does help and it does help others. Some people learn better when they read what I write. Some people learn when they hear what I say. So trying to now focus on more ways to communicate the message we want to share here at Plancorp, and at BrightPlan in ways people can digest and that help the most people out in the public. Tim Mullooly: You now mentioned both Plancorp and BrightPlan, and you’re co-chief investment officer for both of those, right? Peter Lazaroff: That’s right. Plancorp is like your traditional RIA, we manage a little bit over four billion dollars. We’re headquartered in Saint Louis, we have offices around the country. BrightPlan is our sister company, the product launched in November of 2017. But we had been working on it for a year and a half prior to that date. Really what BrightPlan does is this idea that, “Look, most people don’t have a million dollars. But those people still deserve good advice, and they deserve fiduciary advice.” A lot of the things that we do, while we can’t maybe do detailed tax projections or estate planning analysis and strategies for people without a lot of wealth, we can still help them get into good portfolios and help them establish plans. So BrightPlan is a hybrid robo-advisor where you get on the platform, it’s goals based investing. So you set goals, whether it’s retirement or emergency fund, or saving for your 529. But also stuff like debt reduction, leaving a legacy and try to help you optimize those goals. It’s driven by the same portfolios that we’re using here at Plancorp, it’s driven by the same financial planning logic that we use with all of our clients. Good investment advice, good financial advice. It applies across the board for demographics. Not everything, there’s a lot of customization that happens at the pure human solution level. But I think for us it felt important … leverage more technology, to reach a bigger audience. Also, I think there’s a lot of products out there that are great that we were trying to combine together to have a solution here internally for the Plancorp client. But this kind of allowed us to build a Plancorp version of this platform we’ve launched for BrightPlan. But the Plancorp version is really everything that we ever dreamed about. It continually improves, it’s a really exciting program. Really exciting product, great people, we spend a lot of time on the West Coast with our team out there of engineers. But it’s generally the two companies together, both CEFEX certified. BrightPlan was the first certified fiduciary as a robo. Plancorp was one of the first firms in the country, 10 or 11 years ago to get that independent verification of fiduciary advice. So I think we’re all really passionate about delivering good advice and trying to put the client first. It’s just through a different medium. Tim Mullooly: For you, personally, do your responsibilities between the two company’s vary at all? Or is it pretty much the same kind of thing for you? Peter Lazaroff: I think now they are pretty similar. When BrightPlan was being built, there was a lot … the workday looked a lot different here. I’m not the only employee who’s a dual employee of the two companies. They’re both totally separate companies. A holding company was created to own pieces of them both. The building process looked different, but generally speaking, every time I have to address a BrightPlan issue, the way I try to think about it is, “How would I handle this if this was a client sitting across from me, in the flesh, at the same desk and table that I’m sitting at?” I think that helps kind of solve a lot of problems. When you try to think too much like somebody is different because they’re on technology, that could lead to some bad solutions. Now, there are some behavioral ticks that we have to be aware of. That’s maybe where the differences lie. But generally speaking I think of my role as looking at different investment solutions for our model portfolios, doing due diligence there. Keeping up-to-date on academic research. Coaching our clients, if you don’t have index funds, you’re going to have tracking error. So coaching clients through that and giving our wealth managers the tools to help people coach through tracking error, or just coach through the many common questions that advisors tend to get. Everybody deals with the same thing if you’re in a broadly diversified portfolio. There’ll be parts of the portfolio that you don’t like. So I think that communication and that coaching is a big part of my role. Then I think the other part, both on behalf of Plancorp and BrightPlan, is just being a megaphone for the mission. For evidence based investing, for fiduciary advice, for putting the client first. I think my megaphone’s grown a little bit over the years. Been fortunate to get an opportunity with Forbes and the Wall Street Journal. Hopefully next year, I have a book coming out, and hopefully that only helps spread the word further. But generally speaking, I would say my role now that BrightPlan is built, looks pretty similar on day to day. The things I do and Plancorp tend to benefit BrightPlan, and vice versa. Tim Mullooly: You mentioned your book that’s coming out next year called Making Money Simple: The Complete Guide to Getting Your Financial House In Order and Keeping It That Way Forever. This is kind of an introductory episode for those listening out there to get you familiar with Peter and his work. We’re also going to have another follow-up episode where we do a deep dive into the book and all the things that are touched on in the book, right around when the book comes out next year. For the listeners now, Peter, can you kind of tease the book little bit, and what people might be able to expect? Peter Lazaroff: Sure. Earlier I had mentioned how I would go out and network with a lot of people. I had this barrier of a million dollar minimum at my old firm. Frequently what I would have people do is fill out a couple of worksheets, and I could look at them real quickly and say, “Hey, this is mostly what you need to do, now why don’t you just go to Vanguard and you can run with it. Call me if you have any questions, I’m happy to help.” The sheets are really simple, they’re goal worksheets. They’re more about defining goals and putting an estimated cost to them, and a time which you’re trying to reach the goal. Kind of backing in to how per month do you need to save to hit these goals. I think what most people face in their 20s, 30s, 40s, is just a capital allocation issue where they have this money, they have this cash flow and they have all these goals. Where should the money go to first and in what type of account. So, the book is a lot of that. The worksheets are the same ones I’ve used in these situations. We actually use them with clients. BrightPlan is built on a lot of the logic. My wife and I have been using them since we’ve been married. So the book is really just trying to create that playbook that I ran on myself, and my wife. Trying to turn career success into financial success. I generally think that the personal finance writing I do, and the personal finance advice that I give, really puts an emphasis on the fact that we’re humans and we have to find solutions to work some of the tendencies that work against us. Like the fact that we think of our future selves as a complete stranger, or we tend to adapt to our environments such that we don’t notice gradual changes, or that we love habits. Everything, I think, in the book is about making a series of really good decisions and trying to turn those decisions into habits via automation. Then just letting compound interest turn those small habits into tremendous outcomes. I always tell people, “The earlier I get to them in life, the bigger impact I’m going to have on their financial life, because the advice has time to compound. Just not interrupting compound interest, and that’s not just in your portfolio, it’s with financial decisions, and you minimize mistakes, you’re going to be successful.” So it’s really just trying to give you guidance there. The first section really sets focuses on goal setting, the second section on investments. The third section, on more of those less frequent big decisions such as estate planning, buying a home, starting a family, etc. So the book is due out February 20th, and yeah, hopefully I’m going to come back and talk about it more. I have to admit it’s actually not done. It’s all written, but I’m in the editing process now. But I’m really excited about it, it’s a project I’ve wanted to do for a long time. For anybody who’s thinking about writing a book, I thought writing a book would be like writing a bunch of blog posts. It is so far from that, it’s quite wild. But ultimately, it’s been a really great experience. Going back to that theme of helping organize my thoughts, I think just that alone, creating a narrative of all the things I believe about when it comes to personal finance, wealth management, or investing, has really been a valuable experience to me. Tim Mullooly: We talked about organizing your thoughts through blog posts. Then I imagine writing a book is just like 10 times, 100 times that magnified. You had mentioned that you had written for the Wall Street Journal and Forbes, I picked out a couple of my favorite and more popular posts that you’ve written. One in particular talked about lifestyle creep. Can you talk about what lifestyle creep is for people out there who might not know the term, and how you can try and avoid it? Peter Lazaroff: Sure. Well, first of all, everybody has lifestyle creep. The way this tends to happen is that you get some kind of raise every year. Without a plan to save that raise, it’s really easy to add a few luxuries to your regular spending. Maybe you add HBO and Showtime, or you buy slightly better bottles of wine, or in my case, slightly better bottles of bourbon. Buy a new iPhone more frequently, or give better gifts, or stay at nicer hotels. All these little things individually aren’t that harmful, especially as you can earn more and truly afford the few luxuries. But they all do have a way of adding up over time, and then before you know it, all of a sudden you’re spending a lot of money. The challenge of lifestyle creep that I see particularly if somebody comes in with their 50s and they never had anything to address lifestyle creep with and they haven’t been saving enough, is well suddenly you have to cut back your lifestyle. That hurts, nobody really loves doing that. I think the key in your 20s is when … there’s been research out of the Federal Reserve, that most of your income growth comes in your 20s. Then you have income growth in your 30s and 40s, it’s just at a slower pace. So the best way to combat lifestyle creep typically, is to start with a high savings rate, but also have a plan to save your raises. Anytime you can automate these processes, it’s great. That could be difficult with raises, you don’t know what type of raise you’re going to get. But most people at least get a cost of living adjustment. But it’s really important when you get those big bumps in compensation, to try to live that first year on your previous budget. You know, when you get a bonus, or your bonus goes up, or if you have a salary plus bonus type comp system. It’s great to live off your salary and never live off your bonus. Anything you can do to kind of get the money out of your checking account as fast as you can so it’s like you never had it. These habits are great if you can employ them right when you get out of college. But I do think using automation, in my opinion, is one of the biggest tools you have at your disposal as an investor, as a saver. When lifestyle creep starts happening, is when you just don’t really make intentional choices with your money. That’s fine, I make a lot unintentional choices with my money, but because so much of my savings are automated and I have built in escalators to the savings. So each year my savings to most of my accounts are going to go up. Now, it’s always by a really aggressive number, but if I find out I have a raise, then I will go back and adjust those automation changes and incorporate that raise there. So, I think it’s something everybody can relate to and I think if you were to print off every expense you’ve had in the last year, chances are if you compared it to the past year, you probably added a subscription to something. You’re probably dining out slightly more, or your grocery bill’s gone up. Or maybe you’re springing for better airlines tickets, or better baseball tickets, or concert tickets, or whatever. But it’s something I think everybody deals with and it’s really important to find a system early on that directs dollars to the things that matter to most, and that just keeps you on track for reaching year end goals. Tim Mullooly: We were talking about compound interest and starting early. Like you were saying, if someone comes in at 50, it’s almost negative compound interest in a sense. That lifestyle creep has been compounding on top of them, they haven’t addressed it since they first started working. It makes it even harder to cut back at that point. It kind of all goes back to starting early and making sure that you’re adjusting for that lifestyle creep from the get go. Along the same lines, just the phrase, budgeting, if you say the word budget to a client, you kind of see them cringe a little bit. No one likes to hear that term. In one of your posts you talked about the phrase reverse budgeting. Can you explain what reverse budgeting is for me? Peter Lazaroff: Sure. Reverse budgeting, I first have to point out, I don’t where the term came from, but I definitely did not make it up myself. I have no idea where I came across it in my career. But whenever I came across it really early in my career, I said, “That makes sense. That’s what I’m doing.” The idea is that I had been sitting in front of spreadsheets once a week. I had such detailed Excel spreadsheets. Again, I’m into personal finance decisions, I have been since I was a little kid. So here I am ultra-committed. Most people are not committed enough to make weekly updates to a spreadsheet for a budget. It also feels really limited, with traditional budgets you might say, “Okay, I have $250 to eat out this month,” You come to week four of the month and you’re already at your budget and somebody has a birthday party at a restaurant. You’re going to go, you’re not going to not go because you hit your budget number. So reverse budgeting is really this idea of figuring out what are your goals, figuring out how much you need to save per month to hit those goals, and then automatically sending that money out towards the different accounts that are funding the goals. Then just kind of spending the rest as you please. I think if you have a spending problem and you’re carrying credit card debt, reverse budgeting is probably not for you. If you’re worried about, or particularly if you’re married or in a relationship where you feel like, “Oh, we want to make sure that we’re both meeting our goals.” After that, you don’t want to have to keep tabs on each other. Well, if everything is going out and you know that you’re on track for your goals, you don’t really have to stress about specific purchases. It’s generally been something … This is what BrightPlan is really built on, is the idea that, “Look, if I have goals of saving for retirement …” that might be max out ROTH IRAs or IRAs, or 401Ks, or 403Bs, whatever. So max out retirement accounts every year, build an emergency fund, pay off student loans, save for a down payment, go on a big vacation, if those are all the goals, and I know one’s due in June of 2019 and the max out retirement goal is every year. The down payment for a home is 2022, whatever, and you divide all of your expected costs by 60, then what you get for the next five years is what you need every month to hit these goals. So just trying to figure that out, because when you, I think by focusing on saving, rather than spending. You can’t spend what you don’t have. That’s generally something people can deal with more. Then it’s also low maintenance. So I kind of went back to the idea that a lot of my financial advice recognizes that we’re all human. If you’re human, you probably don’t like budgeting. There’s not evolutionary pointing thing to specifically … I know a lot of humans, and none of them like budgeting. I think the lack of ongoing time commitment makes it more likely that you’re going to stick with a reverse budget. I think … would you count pennies and end up with more money at the end of your life? Yes, you definitely could. But this is a way to live your life, spend less time focused on the financials, but also know that the good decisions you made setting up the system are going to help you meet your goals. Tim Mullooly: Right, so it’s kind of like paying yourself first and getting the saving out of the way upfront. Then you have the rest to spend on whatever you want. Peter Lazaroff: I think … technology has made this much easier. So I remember downloading Mint the year it came out. I don’t think I could have done this without that app. Naturally I’m now using BrightPlan to track my spending. But Mint is still on my phone. But without Fintech` you really can’t do some of this stuff. What it allowed me to do was get out of my spreadsheet. We don’t live in a spreadsheet, so why would you treat your finances as if you do? Tim Mullooly: Just the kind of tedious activity of having to sit down at the computer, open your spreadsheet, type everything thing out. It’s much easier now to just open your app, punch in what just happened, or connect it with your bank account and have it do it for you. We often tell our clients at Mullooly Asset, “We’re not in the predicting business, we’re in the planning business.” Obviously with a firm like yours, Plancorp, that’s based on financial planning, I feel like you would agree as well. Appropriately one of your posts was titled Don’t Predict, Plan. Can you talk about the harmfulness of getting into the predicting business and how investors can hurt themselves by trying to predict the future? Peter Lazaroff: Sure, yeah. I think generally speaking, because people the way they follow their finances is through the media and is through apps on their phone that have stock market stories underneath them. There is this real tendency to have a really clean, neat link between cause and effect. When that happens people think, “Well, because I can explain the past so succinctly, it must be easy to predict the future.” I don’t think many people actually make that connection in their mind, but that is what happens. I think when you are trying to make predictions, there’s been plenty of research, and generally speaking, regardless of what you’re trying to forecast, whether it’s markets, or politics, or weather, people are just not good at predicting the future. So when you are doing financial planning, if you’re going to plan on things happening as they have in the past. I think the one thing people want to do often is avoid downturns. They say, “Well, there’s …” whatever the reason is, interest rates, valuations, some geo-political issue, some domestic issue. “This is the reason that we’re go to have losses.” The reason always changes. But generally speaking, we never know when and why the next correction or bear market is going to happen, we do know that market downturns happen on a regular basis. So rather than trying to predict the timing or the cause of the next downturn, we believe you’re better off planning on historical levels of volatility persisting over time. What a lot of new advisors do is they do Monte Carlo analysis that accounts for the magnitude and frequency of downturns and making sure that when you have portfolios for your goals, that they can have the ability and you have the willingness to tolerate the volatility that comes with it. So rather than trying to avoid the losses, we’re big believers in just accepting that the losses are part of the process and just like we’re not going to try to predict the losses, we’re not going to try to predict the gains either. I think you generally just have to accept that as a provider of financial capital to companies and governments, to any entity via stocks or bonds, you’re ultimately betting on capitalism and that people like making money. As long as CEOs like making money, they’re going to try to find a way to do that. And that should increase the value of your investment over time. So generally speaking, I think, the planning … Plancorp started in 1983 as a financial planning firm only. It’s a fee only financial planning only. We didn’t start managing money until the mid ’90s. I think it’s kind of a cultural drip down that’s been really important here. Where I feel like most of the meetings that we have with clients are 80 to 90% financial planning and 10 to 20% investment review. Which was a big change for me when I came here. I’m the co-chief investment officer, so naturally I want to come into meetings and talk about investments. For our clients, they get that. It doesn’t happen overnight. A new client takes coaching. I think it helps to live through a downturn, not just like a 10% downturn, but like a real, real downturn, a recession, a bear market, to really gain that trust that, “Look, it would be great to avoid it, but mathematically speaking the benefit of it is not that great. And the likely hood of actually predicting when it’s going to happen, is so low that it’s not worth it.” It would be one thing if the benefit were astronomical, but it’s really does not come out to be that great. If you perfectly time the market, it doesn’t really drive success that much. Your savings rate, your asset allocation, that’s going to play a much bigger role in the end. Tim Mullooly: Yeah, and just the low probability of being able to perfectly time the market just speaks to what you’re saying about understanding that volatility is there. Markets are going to go up and down so you just plan for the fact that that going to happen and set up a plan you’re okay with. Peter Lazaroff: Yeah, there is no perfect portfolio. It’s about finding the one that you can stick with for the longest period of time. So when you get nervous about it, hopefully we as advisors have done a lot of work upfront to have you understand how normal losses are, and that the portfolio you’re in loses money. I know we review our investment policy statements with clients once a year. The reason I like to do it, is I just like to point to the bad historical periods and be like, “Hey, remember, this happens. 10% drops, 20% drops, those are incredibly normal. The 30 and 40 and 50% drops, you’re going to feel scared and that’s perfectly normal too. That’s okay and we’re here for you. We don’t want you to lose sleep over it. If we want anybody to lose sleep over it, we want me to lose sleep over it.” It is so easy to make a prediction about the future, and so easy to hear somebody sound like an expert and make such an eloquent argument for why something might happen in the future. You almost kind of sound like an idiot if you’re like, “Well, no one can predict the future and who knows, it doesn’t matter.” That doesn’t sound as smart so people don’t want to listen to that all the time. So really a lot of coaching, a lot of education, makes that sort of philosophy that you and I both kind of have here on planning over predicting. That it’s required to make that really sink for clients. Tim Mullooly: We’re on the same page with that, definitely. Kind of along the same lines, trying to predict what’s going to outperform or underperform with investments. There’s been a lot of debate over the last couple of years about active versus passive investing. A dime a dozen articles out there on Market Watch, CNBC, all over the place, about what’s better, active versus passive. You wrote an article saying that the active versus passive debate is the wrong debate to be having. Can you explain why you think that that’s the wrong debate? Peter Lazaroff: Generally speaking, I was guilty of this earlier in my year. I would look at the SPIVA score card to the S & P index versus active scorecard, and point to the numbers and say, “Look, the active managers can’t beat the index, so active management is bad.” Now, the thing is that I don’t use just index funds, we been using factor funds since the early to mid ’90s. So that in many ways is active, because you’re deviating from the market portfolio. I think generally speaking, particularly in the advisor community, particularly in the finance Twitter world, people are kind of coming on to the fact it isn’t so much active versus passive. Because you can be highly active with index funds, you can be very passive with traditionally actively managed funds. You have to make a whole bunch of decisions throughout the management of your portfolio that are clearly active. Unless you just own the market portfolio, you’re active. So the real debate is more when you look at why do indexes win in that SPIVA scorecard report. Well, indexes are super low cost, they’re rules based, not forecast based so they have rebalancing rules. There’s no trying to predict when the market goes up or down or what’s going to do well. It has low turnover. Those three things alone, I think make a big difference. So yeah, I think when I wrote the article in Wall Street Journal sometime, I think in 2017, I think that the three points I focused on is that debate should really be high cost versus low cost. Then if you want to go one step further, forecast based versus rules based. The portfolios that we’re implementing on Plancorp and at BrightPlan fall on the side of comparison that index funds do, which is low cost and rules based. I think active managers, they’re cognizant these days of what people are preferring in investor preferences. So I think we’ll see less and less of the active versus passive debate. Then we’ll just debate over which factor is the best. So I think that’s where it’s turning. That, or what’s the best way to classify a factor. To me that’s where … Maybe it’s just because of the bubble I put myself into, and the people that I interact with on a regular basis. That’s what they debate. But to me that’s kind of like the new active versus passive. Tim Mullooly: Right. Like you were saying, I think the debate should be more of high cost versus low cost. But as I was saying that in my head, it’s like, “Well, is that really a debate? Wouldn’t you always naturally want to have a lower cost?” Because that is essentially built in performance there if you’re choosing a fund that is 75 bases points lower than an alternative. Peter Lazaroff: Right, that’s a good point. As you’re saying that, I’m thinking, “Well, if you offered me every fund in the world for free, then what? Then what would I put in?” I guess going to that next level of rules based versus forecast based. But even then, there’s a lot of rules based stuff that is based out of data mining. There’s definitely, lots of stuff looks great on paper. Then even when things look great on paper, and they’re working the way that they should, that doesn’t necessarily mean that the end investor A, understands them and B, can deal with the fact that, “Hey, this investment is working. It’s lowly correlated to equities, but oh my gosh, it’s 1% versus the market being up 10% this year.” That’s hard to deal with. So it’s all about, again, what can you stick with? Peter Lazaroff: Although it’s harder to know in advance what that really is. I think that’s, when people talk about robos replacing humans, which I think that has died down a lot. One of the skills that you can have as a human advisor is trying to pick up on cues on when people really know what they can and can’t handle. We have very skewed perceptions of our ability to tolerate risk. I’m going to use the word risk in the sense of more than just volatility, but in tracking error, not meeting goals, and permanent loss on capital and uncertainty. Those are things that I think it’s really hard for people to know in advance. That’s again, why the value of advisory I mentioned earlier, I think a lot of this stuff you can do on your own. It takes extreme discipline and it takes a lot of self awareness, and a lot of honesty with yourself. Sometimes having an objective third party, I think, really does help. People point to fees all the time, but I think a good advisor earns a lifetime worth of fees by having you avoid a few bad decisions. It’s hard to quantify, I know Vanguard definitely tries to and I applaud them for doing so, and I’m really happy they do. I don’t know if can latch onto their 3% added value or not, but, there is definitely value there. Tim Mullooly: It’s all about being able to coach your clients into making the best decisions possible, I totally agree. Segwaying nicely into my next question about coaching, I’ve seen on Twitter you’re a big Cardinals fan. First off, what do you think happens with them down the stretch? Do you think they’re sneaking in the playoffs? Peter Lazaroff: If you had asked me a week ago, I would have said with a high degree of certainty, “Yes.” They’ve stumbled a little in the … six days. Although we just won a series against the Nationals. But, yeah, I think I’m going to go ahead an optimist and say that we can squeeze into the wild card. Tim Mullooly: I think they’re probably going to squeeze in. I think, honestly, three teams from the central might get in with the Brewers and the Cubs, which would make for a pretty interesting national playoffs. Peter Lazaroff: Yeah, anytime the Cardinals, Cubs … I mean, I’m biased in thinking that the Cardinals Cubs rivalry is the best in baseball. Whereas, obviously, most people are going to say Yankees, Red Sox. But Cardinals and Cubs played six times, I think, in the last 10 games. I know me and friends are going to Wrigley Field for the season ending series of the Cardinals, Cubs. So a lot can change in the division near the last two weeks. But it’s been fun to watch. The Cardinals had a manager change. Cardinals most of my adult life have been winning. When I was younger we went through a pretty big period of losing. So I’m a super spoiled baseball fan. But I’ll watch almost any baseball game, I’m not exclusive with the Cardinals, but I certainly watch more Cardinals baseball than anything else. Peter Lazaroff: We were talking, yeah, yeah. Tim Mullooly: … finance and investing. We constantly in the office have a debate about the actual impact of a major league baseball manager on team performance. Brendan kind of sides with the fact that he doesn’t think that managers have that much of an effect on how a baseball team performs. Others here have differing thoughts. In terms of managers, both in baseball and client accounts investing, what do you think is the biggest value managers add to their team or to their advisors. Are they the same across baseball and investing, or is one different than the other? Peter Lazaroff: Well, let me start by getting into the debate with you and your brother, by saying a manager can intentionally lose a game. So he definitely matters. That’s like that Michael Mauboussin skill versus luck idea. Where if you can intentionally lose, then there is some skill involved. But I think for a manager, I’ve never been in a real major league clubhouse, so I think all my perspective is a fan. But I have spent most of my baseball life watching Tony LaRussa, who will be a Hall of Famer one day. It seems like a good manager is able to get the best performance or effort from each individual player. How do you bring out the best in somebody and how do you communicate those ideas? All these guys at the major league baseball level are incredible athletes and they’re incredible baseball players. Just advancing to the major leagues from the multiple levels of the minors is a huge accomplishment. But the manager who is able to communicate ideas and get people to improve and to put forth their best self, is impressive. I think that’s what makes a good major league baseball manager, and to your question, what is the similarity with advisors? I guess, communication is a huge part of being an advisor. What’s the best performance that a client can give for me? Well, they can keep me informed of all their financial happenings. They can stick to a portfolio. When I’m communicating ideas, and they need to do things … A great example might be, you got your estate documents done, but you don’t actually fund your trust, because you don’t go around and retitle all of your accounts. Or retitle the deed to your house, or whatever. If I’m a good advisor, I’m communicating the importance of that. I’m trying to follow up and make sure it happens. That’s me getting the most effort out of you. When I can get you to listen to the philosophy and understand our investment philosophy, and understand why we’re doing things with the portfolio. Communicating in a way that you have confidence to go live your life. Maybe that’s kind of the translation between a good MLB manager and good financial advisor. The one difference perhaps, you know that a manager has an advantage over versus an advisor is, a manager can engage in a truth seeking session. I don’t know if you read Annie Dukes book this year, Thinking In Bets. But she talks about truth seeking and providing real feedback. You can’t really tell a client, you can’t give them feedback on their behavior in quite the same way, probably, that a major league baseball manager can. But you can still help people realize that the decisions or the views that they’re holding may conflict with their end goals. So I’m a good manager if I’m helping you realize all your goals, and I’m an even better manager if you don’t lose sleep over it. So, I guess, that’s maybe the connections I can make. Tim Mullooly: Totally agree, just being able to bring out the best in whether it’s your player or your client. It’s probably the most impactful thing that a manager or an advisor can do. Going back to what you were saying about being able to intentionally lose a game, I totally agree with that as well. Brendan, I guess … I’m calling Brendan out here, but he’s always, “Well, it’s the players that actually go out and perform. They’re all major league players, they should be able to go out and do their job.” But I guess the manager is more measurable … I don’t know measurable, but more impactful job is, like you were saying, you’ve never been in a clubhouse, me either. So we don’t know what they do behind closed doors. I feel like that might be the most important thing that a manager does. Same thing with an advisor, on the surface you see the numbers of the plan, but kind of just coaching the emotions of the client behind closed doors, so to speak. Really just brings out the best in either a player or a client. Peter Lazaroff: Right, because if you have an MVP, caliber a player who’s a great hitter who has a problem going off at the swing and you tell him. He goes, “What does that guy know, he didn’t even make it past AA or AAA … or only had a short career in the majors.” He may not listen to you. So I think the manager’s definitely that, the communication is huge. Obviously they could just put nine pitchers in the starting line ups and lose the game. So obviously they have the ability to intentionally lose. But, yeah, it’s up to the player too in how they … I think with the Cardinals, for example, since that is where we came in with this. They changed managers and Mike Shildt has done a really good job of incorporating the data, the sabermetric data, and also input from other coaches. Before games, he’s having sessions with everybody and pointing out and saying, This was a great base running move here,” and, “Hey, you made a little mistake here on the relay. This is where you should be positioned.” The whole team hears and the whole team is trying to get better. Look, maybe that wouldn’t work with every clubhouse, but a manager needs to know that. There’s a reason that managers like Joe Maddon win and Tony Russo have won. It obviously matters somewhat, but the individual player, without them it doesn’t work. Just like the client in the advisor relationship, I can give great advice, I can communicate well, but if you don’t earn a substantial amount of money, I can’t get you magically to 10 million dollars if you only earn $50,000 a year. It’s just not going to happen. And if you don’t tell me everything that relevant in your financial life, similarly, I’m not going to be able to necessarily get you to being in the best shape that you possible could. Tim Mullooly: Along the same lines of advice, we got a couple questions left for you here, Peter. Geared more towards piece of advice that you’ve gotten in your life. If you had to pick one or two pieces of advice that you would say are the best over your career, whether it’s personal, or professional or both? Peter Lazaroff: I think professionally, somebody told me really early in life … I have a series of mentors outside of my company, which has been really great. One of them had told me, “The key to being successful, is that the people around you, have to want you to be successful.” I think that’s really important. There’s a lot of people who do you favors along the way and they have to advocate for you professionally, and they have to make introductions. So I think recognizing that you can work super hard, you can be the hardest worker, you can be the smartest person, but the people around you still are going to want you to be successful too. So I think that’s really important, a little bit overlooked. Tim Mullooly: Would you say that those pieces of advice that you’ve gotten are the same advice that you would give someone just entering our industry today? Peter Lazaroff: For the financial industry, specifically, and actually this might apply to other industries as well. I would just tell people to network like crazy, and read more and watch less TV. I, at the young end of my career didn’t network like crazy, I didn’t read more, and watched less TV. Someone had told me that, and I was like, “Yeah, sure,” and now I’m at the age where that person was when they told me when I was 22. I’m now realizing, yeah, if you’re getting into this industry, the one thing I’ve come to realize is, every time I read a book, I realize there’s so much I don’t know. I definitely think the other thing, when you network, you learn about people, you make connections. I think the art of intentionally networking, not just networking to make sales, but networking just to network, is somewhat of a lost art these days. Tim Mullooly: Like you’re saying, whether it’s networking, learning about people, or reading and learning about what’s in the books, there’s always just more to learn in general. Whether it’s from a person or from a book, great piece of advice to end on. Peter, that is the last question that I had for our first episode. I’m looking forward to having you back on in a couple of months when the book comes out, so we can talk more about the book. But for anyone listening out there, we’ll link in the show notes to Peter’s website. Where you can find all of the blog posts that we talked about today, as well as the Plancorp website, and BrightPlan as well. Thanks for listening to this episode of Living With Money, and we’ll see you on the next one.